Pen and Ink , 10" x 14"
My artwork is an exploration of the compositional and textural elements found in nature and rural settings. Working exclusively in black and white, the strong contrast of ink on paper allows me to focus on the detail, tone and texture of my subject matter. To me, color is a distraction. On a personal level there is a strong connection between my art and my faith. The close examination of nature, with pencil or pen, prompting a desire for deep introspective work. Stacy Topjian Searle is a pen and ink landscape artist from Nashua, New Hampshire who works exclusively in black and white. Searle began her art education at the Massachusetts College of Art in Boston Massachusetts. She later earned a BA in Art from the University of Lowell, Lowell Massachusetts, where her focus was on Illustration. Stacy uses on-site sketches and photographs as references for her work. She begins by laying out the general composition of a piece in pencil. Once a composition is in place, ink is applied to create a contour drawing of the scene. 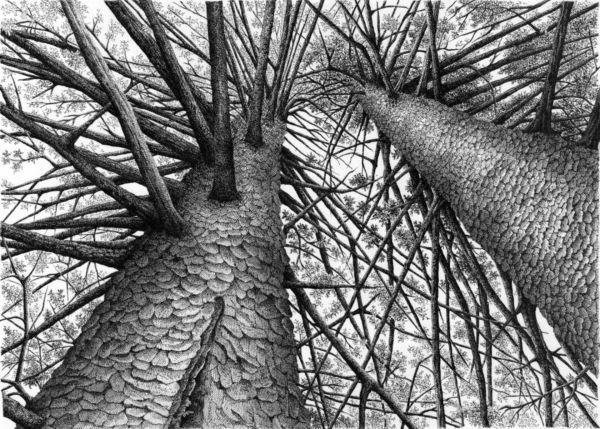 Detail is developed through her unique blend of cross hatching, contour lines, parallel lines, stippling and scrumbling techniques to create the mood of each piece. Creation inspires most of Searle’s work and by focusing on the complexity and details of nature she hopes to increase awareness to the need for conservation and preservation. Stacy is an award-winning juried artist and is a member of the Nashua Area Artists Association. She has participated in Nashua’s Art Walk and has exhibited in group exhibitions at ArtHub Gallery in Nashua, NH, Beaver Brook in Hollis, NH, the Whitty Gallery in Hollis, NH, the Brush Gallery in Lowell, MA, the ALL Gallery in Lowell, MA, Angles and Art Gallery in Haverhill, MA, The Fitchburg Art Museum in Fitchburg, MA, and Uforge Gallery in Boston, MA.